Proposed New Diocese in Northern Melanesia. Sydney: D. S. Ford for the Australian Board of Missions, 1928. Right Rev. Bishop E. N. Wilton, chosen by the Australian Church for the Mandated Territory. The Diocese is to include the whole of the Australian Mandate, and covers the area enclosed by the dotted line. The foundation of a new Diocese in the Mandated Territory of New Guinea is the present objective of the Church of England in Australia. The Mandated Territory belongs politically to Australia, and as a natural consequence it is strongly felt on all sides--in in England, New Zealand, and Melanesia, as well as in Australia--that this part of the Pacific should he also ecclesiastically united with Australia. Now, the Church in Australia, as well as elsewhere, is fully aware of its responsibilities in this matter, as shown by the consecration of the first Bishop (Rt. Rev. E. N. Wilton) in St. Andrew's Cathedral, Sydney, on S. Barnabas' Day, 11th June, 1928. It is recognised that the ideal manner in which the trust given to the Church should be discharged, is in the formation of a Missionary Diocese attached to one of the Provinces of the Australian Church. The Bishop of Melanesia (Rt. Rev. 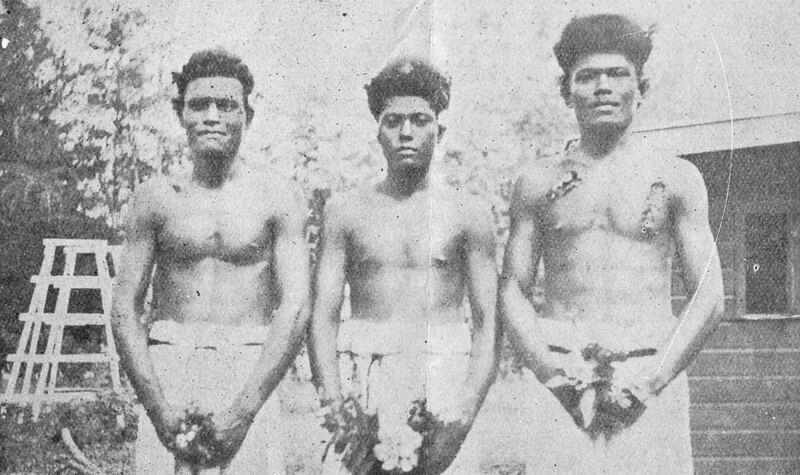 J. M. Steward) laid before the Australian Board of Missions, at a meeting held in Sydney, New South Wales, in 1925, a proposal that the work of the Church in the Mandated Territory should be started under a Bishop, who should, till further arrangements could be made, begin as an Assistant-Bishop of the Melanesian Mission. This proposal was gratefully accepted, and now we have our new Bishop. The fact that this is primarily the work of the Australian Church is emphasised by the action of the Primate of New Zealand, who made it possible for Bishop Wilton to be consecrated in Australia. The Mandated Territory, it must be remembered, has been entrusted to the care of Australia by a special mandate from the League of Nations. We are the trustees of this vast territory (ninety thousand square miles of land in two million square miles of sea). The terms of the mandate say: "The Mandatory (Australia) shall promote to the utmost the material and moral well-being and the social progress of the inhabitants of the territory, subject to the present mandate." There is abundant evidence that the Commonwealth Government is honestly trying to fulfil its obligation to the League of Nations, and is seeking to bring about the social and moral well-being of the native inhabitants of the Territory. The Administrator of the Territory (Brig.-General Wisdom) and his staff are doing their part splendidly. How very necessary it is, then, that the Church-people of Australia should rally to the urgent call to stand behind the little band that is going forth in September of this year to found a new Diocese of the old Church in these recently acquired "possessions." The staff of the new extension work comprises, besides Bishop Wilton (who is a "dinkum" Australian and is confidently going our at the unanimous and urgent . call of the Bishops acting for the Australian Board of Missions), the Rev. 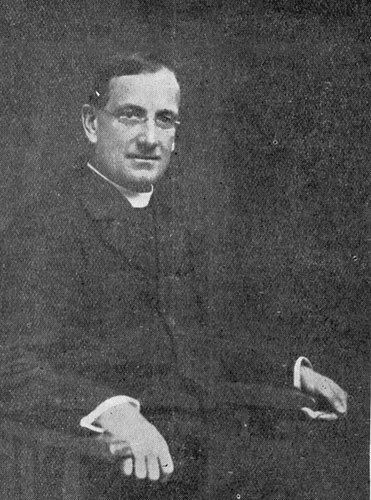 Frederick R. Bishop, at present on strenuous propaganda work in England (whose three and a half years' service in the Territory has been warmly commended by those best qualified to speak); the Rev. L. E. Cartridge, a young and brilliant Oxonian; the Rev. Vernon Sherwin, who, after six years of devoted and faithful work amongst the aborigines in the North-West of Australia, has just presented his first report of hard and exacting pioneering efforts on the south and south-west of the island of New Britain; the Rev. 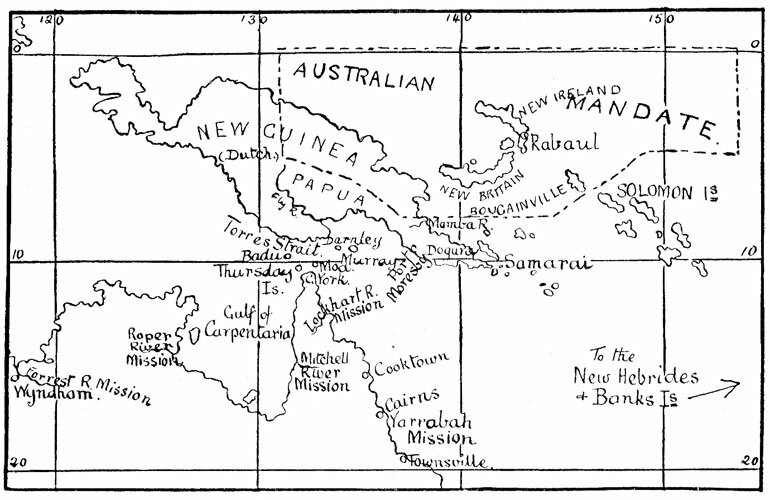 Thomas W. Barry, locum tenens in Rabaul, holding the position with energy and enthusiasm; and Mr. Stanley Titter, a Victorian carpenter of considerable experience, who has pluckily volunteered and will go with the others to "dig in" on the Gasmata coast, in the name of the Church of England. Warm commendation of this very proper and most praiseworthy advance has come from all directions by cables, telegrams and carefully worded resolutions. The Diocese of Newcastle, at its session in May last, says "This Synod sends its greetings and best wishes and assurances of prayerful interest in the extension work of the Church in the Mandated Territory." The Sydney Clerical Prayer Union conveys its congratulations and promises a prayerful interest in the new work, and expresses the hope that the Bishop and his co-workers may be much used of God in the extension of His Kingdom. The Acting-President of the A.B.M. meeting in November last, (Bishop Gilbert White), remarks that the Board is thankful that an Australian has been found willing to accept the onerous and difficult task of becoming the first bishop of the northernmost part of the Diocese of Melanesia, which covers the Mandated Territory of New Guinea, and which the Australian Church hopes to make its special care. The Board prays that every blessing of God may attend all the preliminary steps, and the task itself. The Church Army, of London, through Prebendary Carlile asks that strength of body and spirit may be granted to the pioneers of this important work. The Society for the Propagation of the Gospel in Foreign Parts joins the chorus of good wishes for those who are going out to these new and heavy, but withal fascinating, responsibilities. And the Church Missionary Society of Australia and Tasmania, through its Federal Council, by resolution unanimously passed in Melbourne in March of this year, offers its sincerest congratulations and best wishes, and earnestly prays that God may abundantly endow the Bishop with every necessary gift and use him more and more for the confirmation and extension of the Gospel. It is in this atmosphere of encouragement and good wishes, of premise of earnest, constant and prayerful interest, that this great launching cut into the deep has been undertaken. Bishop Wilton is to leave Australia for the new work in the middle of September, and the Australian Church is in honour bound to stand behind this fresh venture of faith in the extension of Christ's Kingdom. Think for a moment what is entailed for the pioneers. It will be necessary to purchase sites, houses, school requisites, medical supplies and the thousand and one items of equipment necessary for the efficient establishment and running of a great mission. And all this in addition to the allowances paid to the workers for their own personal requirements. You are earnestly asked to assist, you arc confidently expected to stand up to and share in this national responsibility and trust that has come to us through the indomitable spirit of those who, to save us in a world-wide crisis, gave all--even life itself. A little cemetery in Rabaul, New Britain, north of New Guinea, testifies to the cost that was paid to give Australia a place among the nations of the world. Nationhood brings its obligations and insistently calls those who enjoy it not to be unworthy or forgetful of those glorious sacrifices that were made in our name and for our sake. If we are out to win, we must be in dead earnest. And Jesus saw a great multitude--a great hungry and helpless multitude, as sheep without a shepherd. Do you see them, too--at least three or four hundred thousand scattered over six hundred islands? And Jesus, "When He saw . . . was moved with compassion for them." Does your heart feel like that? Do you care? "Almighty God, by Thy Holy Spirit, help us both to perceive and know what things we ought to do, and give us grace and power faithfully to fulfil the same; through Jesus Christ our Lord." 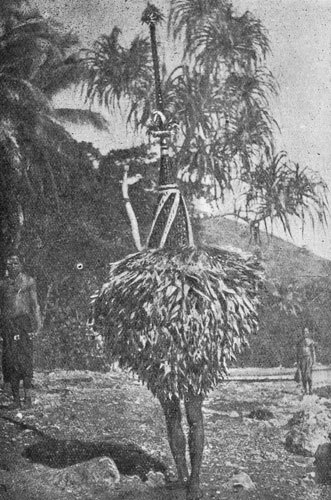 Strange Native Customs--Secret Society, the Duk Duk. Friends and members of the Australian Church, listen to the Call that comes to you from the Mandated Territory, for which Australia is responsible in the eyes of the whole world. or direct to Bishop Wilton, at "Challowdene," Illawarra Street, Mosman, Sydney, New South Wales. 2. I shall be glad to subscribe the sum of £_______ annually. Please note that the Mandated Territory means new work and thus extra expenditure, therefore donations should be over and above any help you already give to Missions. The Bishop will be pleased to keep in touch with all subscribers, whose names are given in on this form. D. S. Ford, Printers, 44-50 Reservoir St., Sydney.